With the HubSpot Sales Chrome extension or the HubSpot Sales for Windows tray app, real-time notifications are triggered when a lead revisits your site, a tracked email is opened or clicked, a shared document is viewed, or a meeting is booked. These notifications will appear in real-time, and can be reviewed and managed from your activity feed in HubSpot. Please note: free users only receive 200 notifications per month. If this monthly limit is reached, you will still be able to send tracked emails and receive instant notifications, but you will not be able to view your activity feed until your notification count has been reset. Your notification count will reset on the first calendar day of each month. If you go over the 200 notification limit, consider upgrading to Sales Hub Starter, Professional, or Enterprise, for unlimited notifications and other paid sales features. In order to receive real-time notifications, you must have Google Chrome running on your computer with the HubSpot Sales extension installed, or the HubSpot Sales for Windows tray app installed. Depending on which version of the extension you are using, these notifications will appear in one of two locations on your device. HubSpot Sales Chrome extension: real-time notifications will appear in the upper right of your Chrome browser. To quickly silence notifications for short periods of time, in the upper right, click the HubSpot sprocket icon sprocket, then click the gear icon settings. Click to toggle the Pop up notifications switch off. HubSpot Sales for Windows tray app: real-time notifications will appear in the bottom right of your PC in the tray app. To silence real-time notifications, in the tray app, right-click the HubSpot sprocket icon sprocket and select Pause Notifications. You can view your recent activity all in one place in your activity feed. Activities are grouped by contact and are unique to the account you are signed into when viewing the feed. Please note: the email tracking activity included in your activity feed is specific to emails you have sent. No one else can view this information, even account administrators. 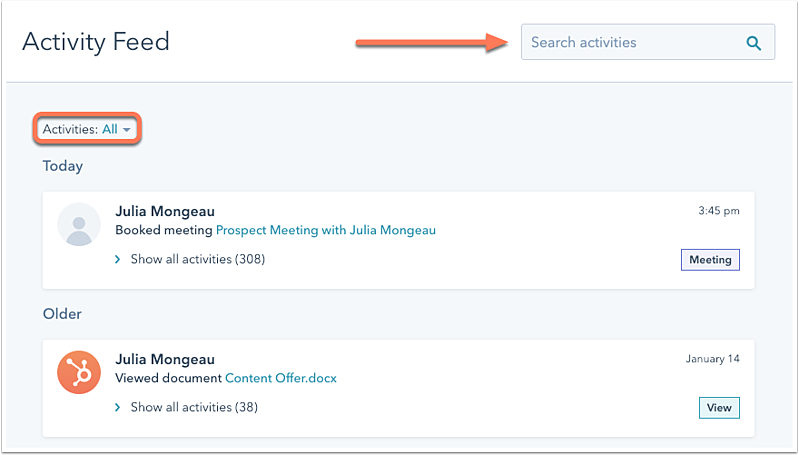 In your HubSpot account, navigate to Contacts > Activity Feed. Use the search bar to search for a specific activity. All: view all recent activity. Email opens: view all recent email opens. If an open location is identified, the notification in your feed will indicate where the recipient was located when the email was opened. Learn more about why you may also see multiple opens for the same email. Email clicks: view all recent email clicks. Sent emails: view all recent sent emails. Document views: view all recent views on your sales documents. Page visits: view all recent page visits. Prospect visits: view all recent visits from your prospects. Form submissions: view all recent form submissions. Meetings: view all recent meetings booked with a HubSpot meetings link. To view all of a contact's recent activities, click Show all activities (number of activities). To follow up with a contact over the phone or in an email, or to create a follow-up task, hover over the activity and select Call, Email, or Create task. If you want to create a note, log an activity, schedule a meeting, or mute the notification, click the More dropdown menu and select an activity.